Life of Pi by Yann Martel is a survival story of a boy named Piscine, also called Pi, who has been stranded out in the middle of the Pacific Ocean. He lose all his belongings and his entire family. He lives in a life-boat, and catches fish to survive. One last things is that, when he escaped from the falling ship, a bangolian tiger named Richard Parker got into his life-boat. Pi and Richard Parker keeps a safe distance and tries to survive with each other’s presence. Pi tries his best to gather as much as rainwater, as much as fish, and as much distance away from Richard Parker to stay alive. Richard Parker stays nearly all day under the tarpaulin of the boat. 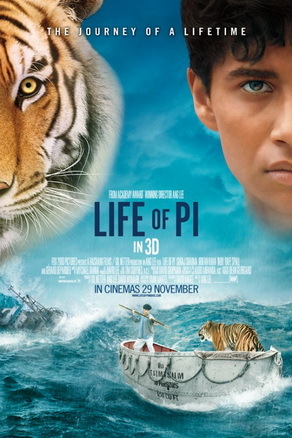 As the story goes on, Richard Parker and Pi starts to be used to each other and manages to set their own territories in the boat. Pi keeps a diary, recording everything that happens and everything he felt. he also states that Richard Parker is a big attribute of his survival in the diary because Richard Parker kept him stay alert, and made a companion to care about. Richard Parker was also starting to keep a distance from Pi’s territory and didn’t attack him. Even though they were resourceful and alert for fish, they struggled everyday to fight off the hunger and thirst. During their tough days, they experienced bizarre occurrences that seemed imaginary. Pi comes upon a floating island made of an exotic species of algae and seaweed. After few weeks, Pi and Richard Parker reaches their destination of destiny. Life of Pi is a great book, I expect to read it again someday. The writing style catches the reader’s attention like TV. It makes you feel like I am watching a movie. When I started reading the book, I couldn’t take my eyes off the book because I never knew what was going to happen next and how some conflicts solved. Because the book had a unique and exotic plot, it was obviously one of the coolest book I’ve ever read. I really liked the part where Pi meets the blind Frenchman in the ocean. It was also one of the weirdest part of this book. I think the beginning of the book might be hard for some people because it uses complex science language. I think my age (14) or maybe even higher can be suited to read this book. I would give this book about 10 out of 10 because it is just an awesome book and has some deep themes too. 1. What was Piscine named after? 3. Why did Piscine’s dad show Piscine how tigers eat? 5. What did Piscine say when his dad said he only has to believe in one religion? 4. Which language can Piscine speak? 6. Who managed to get on the safe boat? 7. What happens to the zebra? 8. How was Richard Parker named? 9. What was inside the small storage near the stern of the boat? 10. What is a solar still? 11. What did Pi use to protect himself while training Richard Parker? 12. Did Pi succeed in taming / training Richard Parker? 13. What stopped Pi from swimming in water? 14. What did Pi care more than gold, sapphires, rubies, and diamonds? 15. Who did Pi meet in the middle of the Pacific?